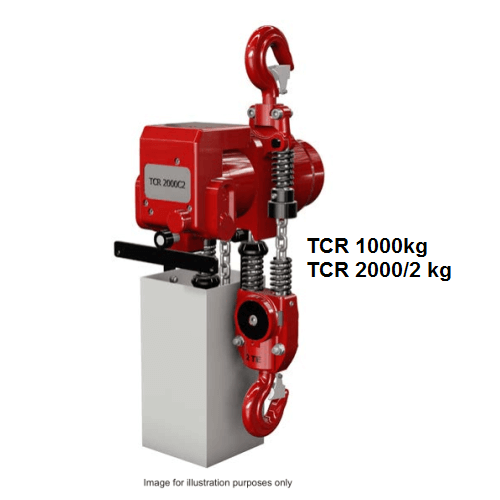 Red Rooster TCR Pneumatic Air Hoists are robust hoisting devices, perfect for lifting where an air supply is available and where the use of electrical power is not feasible. The Red Rooster TCR air hoists range consists of 9 models with an excellent range of working load limits to choose from starting at 500kg up to 15000kg. The TCR range are ATEX rated to group 2 for above ground use as standard though can be re-classified for use in zone 1 with additional built in protection. 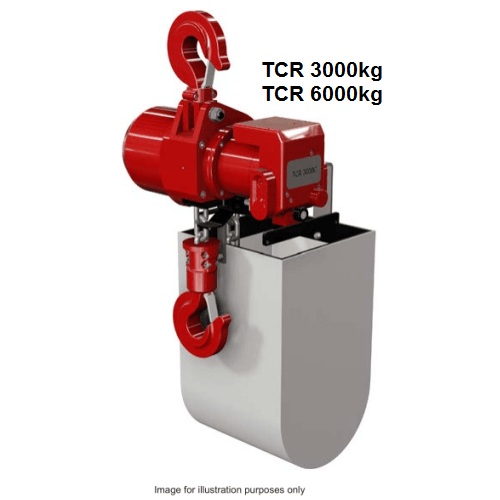 The TCR range incorporates a Toku rotary vane motor; these have been designed to use clean, dry and lubricated air. 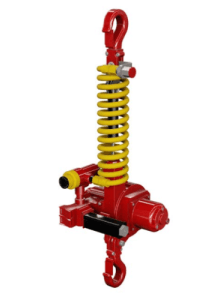 They can be operated between 5 & 6 bar (72 - 90psi) working air pressure though the operating speeds stated in the specification tables are only reached when using the top 6 bar pressure. 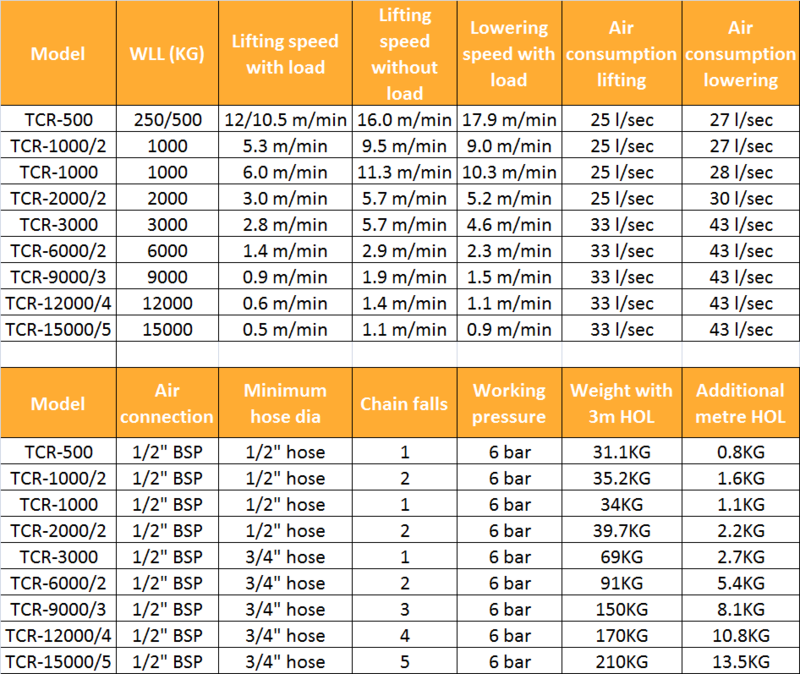 If using the hoist at lower pair pressures the hoist will operate at a much lower speed. It is essential to ensure adequate air supplies by using the correct hose diameter. The air supply hose must be supported (on support brackets) they must not hang freely due to their weight. 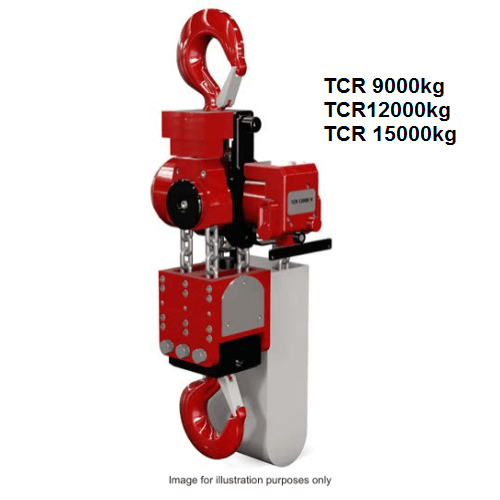 Other features include an epicycle gearbox, internal disc brake with failsafe mechanism, alloy steel hooks with safety latches and chain for 3 metres height of lift as standard. 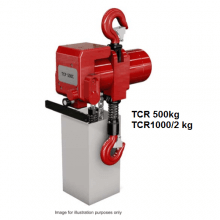 The Red Rooster TCR range of air hoists have mechanical upper & lower limit switches to limit chain travel. All models also incorporate a load limiter for the highest overload protection. This comes set to the factory standard of 10% above the nominal working load limit so it is rarely necessary to adjust the load limiter. By measuring drops in pressure, proportional to the load on the motor the limit is carefully monitored, if the pressure drop increases above its setting the brake automatically goes on and the lift is stopped. Lowering the load is still possible. Because the TCR hoists are fitted with internal silencing features the noise level is reduced to lower than 83dB at 1m, conforming to E.C. regulations. The 2 stage silencing device uses nylon pads to trap particles and then multiple layered micro-porous steel gauze. The nylon pads may be recycled, with a thorough wash and degrease the pads can be reused. 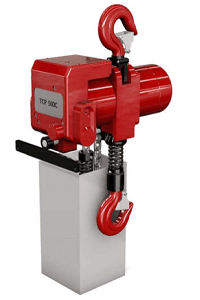 The hoists exhaust air & oil will go back into the atmosphere unless it is piped away, exhaust pipes and filter silencing units are available, with the filter removing 99.9% of oil from the exhaust air and also reduce the noise levels. The Red Rooster TCR air hoists come with a choice of pull cord or pendant control and many other optional extras including extra corrosion resistance, special paint, marine specs, air service units, radio control, chain collectors and main air shut off valves. Let us know on ordering if you require any extras. If you require an air hoist for heavier loads we can supply the Red Rooster TNC air hoist range with WLL up to 50 tonne.